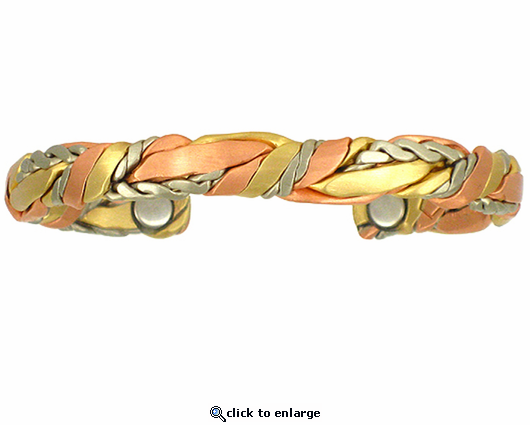 This Sergio Lub style #578 Brushed Sage Bundle handmade copper magnetic bracelet has two rare earth magnets and is made of pure metals. No plating is used and it is Made in USA. It is about 1/3" wide. Excellent Craftsmanship and my wife loved it, she wears it everyday! Good quality, great service from the costumer services, quick delivery, if only the postal service would deliver letters this quickly. I will always look to you guys first for any future bracelets. This is a wonderful peace. I noticed almost instant a feeling and my pains have almost disappeared. Bracelet is beautiful in appearance and quality. Fits nicely on a smaller wrist. I am most impressed with the customer service of this company. I would highly reccomend them. Love the design and craftsmanship. Fits well. Very happy with my new purchase. It is beautifully crafted and is my second one, only a different style this time.